WHERE IS YOUR SEARCH LEADING YOU? Look around you. The world is constantly grappling with crisis and war. People are weary from the dysfunction of their own lives. The chaos is crying out for order. The complexity is crying out for simplicity. At every level in society, from the beggar on the street to the leaders of nations, we are all looking for something to solve the crisis of our lives and of our times. It is time to stop looking for something and start looking to someone - Jesus of Nazareth. 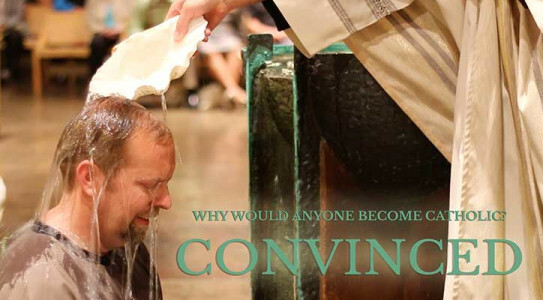 movie, Convinced, shares the story of over 20 people from all walks of life as they journey towards home to the Catholic Church. Featuring Dr. Scott Hahn, Jennifer Fulwiler, Abby Johnson, Jeff Cavins, Brandon Vogt, and many more! Our Becoming Catholic program provides an informal, pleasant place to ask and learn about the history teachings and foundations of the Christian Church. The classes are primarily intended for those who are inquiring about the Catholic faith and may possibly be wanting to move towards full initiation (RCIA Rite of Christian Initiation for Adults) into the Catholic Church. There is no cost for this program. You must be out of high school to attend these classes. If you are still in high school, please contact Margot Loza (Youth Ministry Director). The calendar below is a quick resource regarding classes and RCIA-related events. Holy Days and Mass times will also listed on this calendar.